Construction was completed in January 2017 for the 87,500-square-foot, $52 million Design Building. Occupied starting in Spring 2017, it houses three academic units from three separate colleges, the Department of Landscape Architecture & Regional Planning from the College of Social and Behavioral Sciences; the Department of Architecture from the College of Humanities and Fine Arts, and the Building and Construction Technology Program, part of the Department of Environmental Conservation from the College of Natural Sciences. LARP and BCT are also part of the School of Earth and Sustainability (SES). Design Building wins U.S. Building of the year!!! 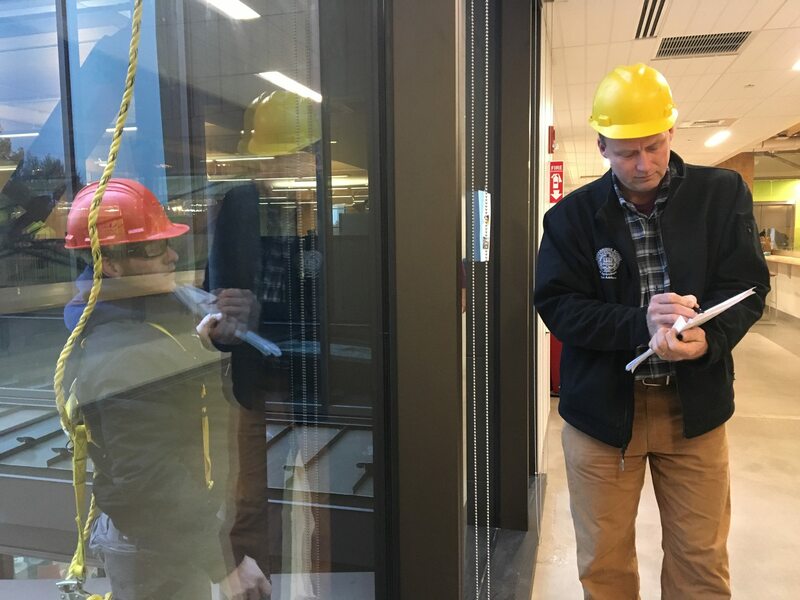 The senior Landscape Contracting class finished the Aerial Lift hands on portion of their safety training yesterday with UMass Physical Plant staff member Herb Harris and with Michael Kauffman, Safety Services Manager, UM Environmental Health & Safety. 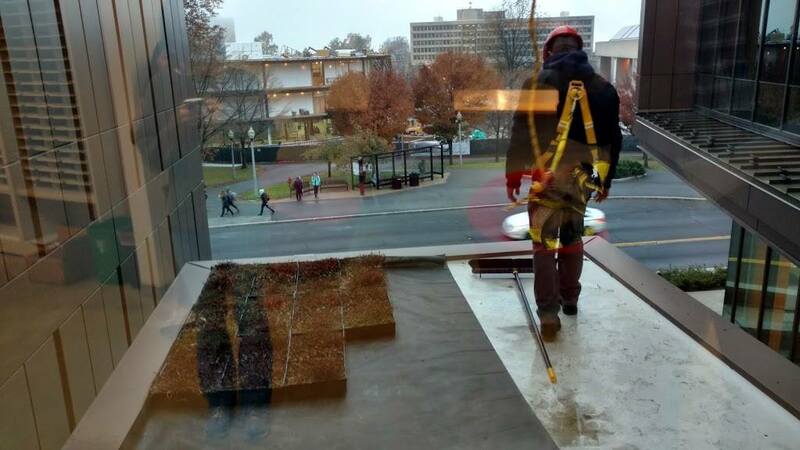 Under Michael Davidsohn's instruction, the class safely installed the green-roof tray system donated by Eco-Roofs on to the roof above the West entry to our new John Olver Design Building. 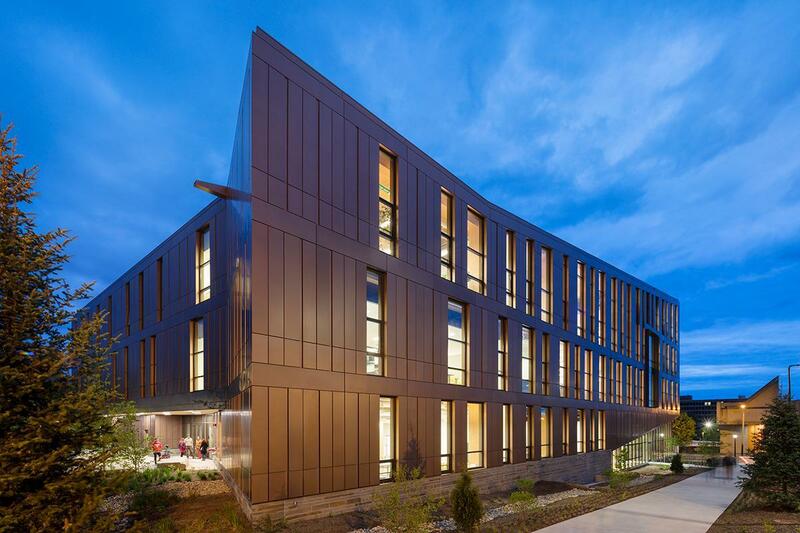 The John W. Olver Design Building has been honored with an Award of Merit in the Engineering News-Record (ENR) list of New England’s 2017 Best Projects. ENR, an industry weekly, announced the award in the Higher Education / Research category. The building is the most technologically advanced cross-laminated timber (CLT) building in the country and one of just two in North America using CLT for wind and seismic resistance. The other is the Wood Design and Innovation Center building in British Columbia. The building was designed by Boston architectural firm Leers Weinzapfel Associates, and construction was managed by Suffolk of Boston. Constructed of CLT timber and glue-laminated columns, the 87,000-square-foot facility saves the equivalent of over 2,300 metric tons of carbon when compared to a traditional energy-intensive steel and concrete building. The university’s Building and Construction Technology program developed some of the CLT technology and has been testing native Massachusetts species for CLT suitability with support from a National Science Foundation grant. The interdisciplinary building is home to three academic units: architecture; building and construction technology; and landscape architecture and regional planning. It intentionally features exposed structural elements and service systems for teaching, while its Trimble Technology Lab provides advanced tools for design research and development. The building’s multi-disciplinary program, organized around an interior courtyard of exposed timber and an exterior landscaped courtyard and outdoor classroom, fosters collaboration across the disciplines. When the University of Massachusetts Amherst set out to build a new home for its design school, the goal was not just to raise an emblem to its burgeoning building arts program. "From the beginning, we knew that the Design Building would be a teaching tool," says Andrea Leers of the Boston architectural firm Leers Weinzapfel Associates (LWA). As one of the largest timber frame structures on the East Coast, it was fashioned, says Jane Weinzapfel, LWA’s cofounding principal, to be "an experiment celebrating a shared commitment to sustainability." 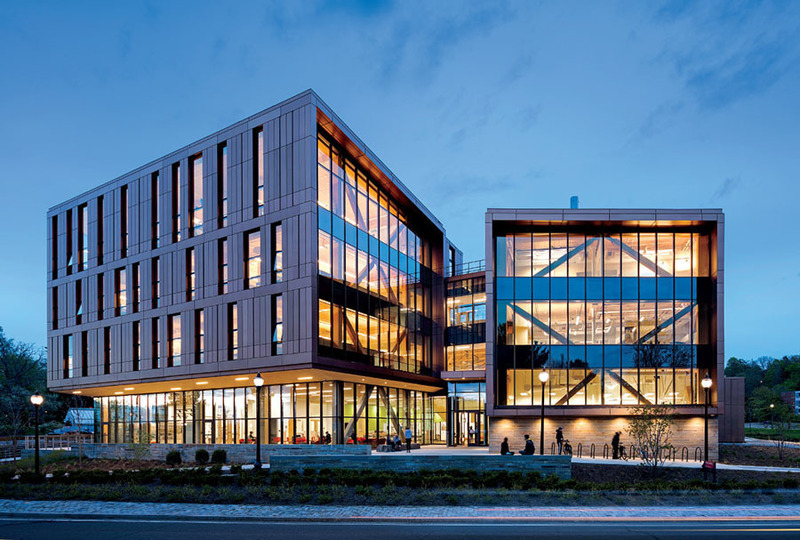 Begun in the summer of 2015 and opened to students in January 2017, the LEED Gold, copper-colored Design Building embodies the dynamic spirit of New England’s first publicly supported architecture program. From a fledging offering in the art department in the early 1970s, design education at UMass, Amherst has grown into a powerhouse. In a region noted for some of the nation’s oldest and most renowned architecture schools (Massachusetts Institute of Technology, Harvard University, and Yale University), the $52 million Design Building announces the arrival of the new kid on the block. It is always revealing when architects build for themselves. But what is exemplary about this project is that it is the cooperative venture of three departments: landscape architecture, architecture, and building technology, from three colleges: Social and Behavioral Sciences, Humanities and Fine Arts, and Natural Sciences, respectively. 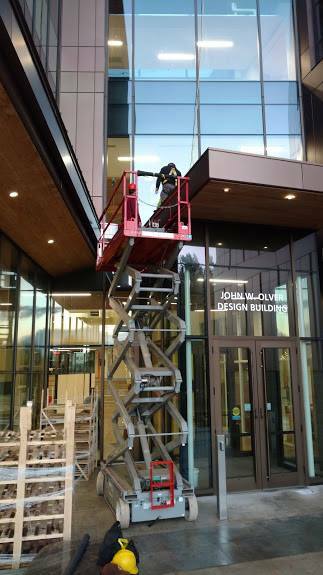 These wide-ranging disciplines combine in what LWA principal Josiah Stevenson calls "a highly visible demonstration of sustainable design practice." The university’s Department of Building and Construction Technology, led by Alexander Schreyer, a guru of heavy-timber structural systems such as laminated glued wood, was involved in developing the framing for the 87,000-square-foot building. LWA had designed a conventional steel frame, but the Commonwealth came up with an additional $2 million so the studios could be constructed of wood. Using such materials as glued and cross-laminated timbers, or glulam (what Stevenson calls "plywood on steroids") on such a scale allowed for a near revolutionary accomplishment. "All the structural members arrived on the site pre-cut and were snapped together with pins," says Schreyer. "The columns were already finished, with no need for fire protection and drywall." The Germany-born engineer says, "We not only show off our research, but we live in it," and best of all, the building "smells like a sauna." Giant spruce trusses are visible in the building’s corners, but what really demonstrates the inventiveness of the wood technology are the zipper trusses that span the 84-by-56-foot common area. They resolved several issues with "the best combination of dynamic form, architectural consistency, structural efficiency, and cost," says LWA principal Tom Chung. 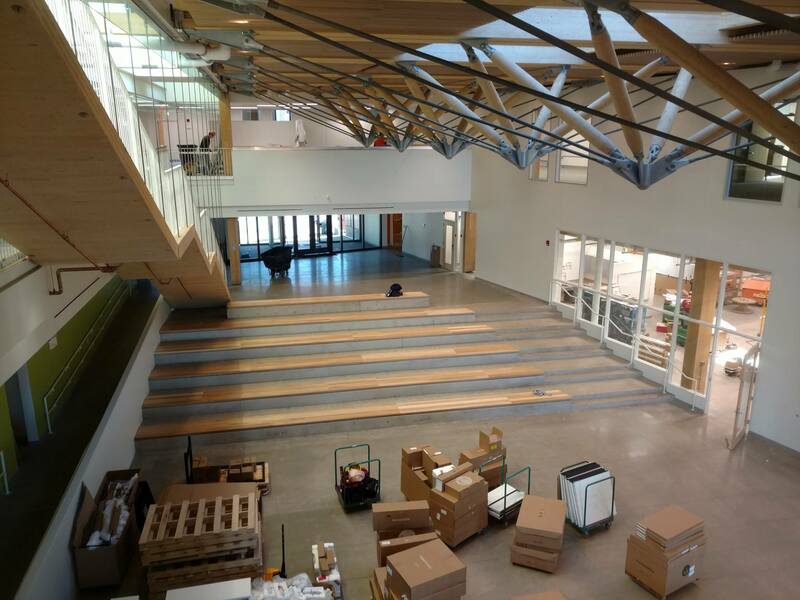 Converging at a single spot, steel rods transfer weight to the glulam beam, creating the building’s signature trusses, which make possible the columnfree two-story-high common space that is the heart of the building. Linking the studio and staff wings, the commons is only 33 feet wide at the rear, so the trapezoidal space seems to recede precipitously from the entrance. Ramps and seating create an ensemble reminiscent of a piazza in an Italian hill village. This perfect gathering place has, says Stephen Schreiber, chair of the Department of Architecture, "already been used for public critiques, major lectures, university receptions, commencement events, accreditation reviews, alumni dinners, pop-up design/build projects, as well as dance performances, concerts, and general socializing." While not as immediately dramatic as the building’s timber skeleton, the landscaping consists of native plants and local bluestone developed into an active waste management system. A roof terrace slows water runoff and reduces the heatisland effect. Best of all, Stevenson notes, it serves "as a contemplative space shared by students and faculty." UMass landscape architecture alumni Lauren and Stephen Stimson of Stephen Stimson Associates in Cambridge and Princeton, Massachusetts, worked closely with the faculty in developing their concept. "I see the new building," says Robert Ryan, chair of the Department of Landscape Architecture and Regional Planning, "as a learning laboratory for our respective programs as students can see green roofs, native ecosystems, and ecologically beneficial storm water management." The main entrance is through a blue-stone-paved courtyard between the two wings of the building. One wing’s base is stone and the other’s is glass, but both are cantilevered over the entrance sidewalk, forming a terrace that provides another natural gathering spot. These overhangs reinforce the tectonic nature of the trusses and columns visible behind the glass walls. A handsome envelope of autumnal-hued aluminum panels wraps the three stories above the ground floor. Asymmetrically placed, tall and narrow window openings are a respectful nod to the drying doors on the tobacco barns that once were the university’s neighbors in the Pioneer Valley and potent symbols of the region’s agriculture. UMass is a relative latecomer to design education in the region. A quiet Georgian campus that was primarily the Commonwealth’s agricultural school was subsumed by explosive growth beginning in the 1960s. The need-rather-than-aesthetics approach was in sharp contrast to attractive, well-established older college neighbors such as Amherst, Mount Holyoke, and Smith. Yet, the Design Building (occupying what was formerly a parking lot) "knits existing buildings into a campus of the arts," says UMass architectural historian and professor Timothy Rohan. "Along a strong east-west axis, it brings together postwar and contemporary architecture, helping to bring Roche Dinkeloo’s powerful Brutalist Fine Arts Center into contact with BIG’s bold new business school addition," a reference to the Business Innovation Hub that will by 2019 create a unified campus for the Isenberg School of Management. BIG — Bjarke Ingels Group headquartered in Copenhagen and New York— may be one of the world’s most innovative architecture firms, but Leers Weinzapfel’s collaborative Design Building is a bold architectural achievement in its own right. LARP will be moving into the Design Building on January 9th and 10th, 2017. Vote Today for DB Award! The Design Building has been nominated in the Education category for a 'The Plan' Award. Voting ends May 2nd, and takes just a moment. and hit the shamrock button, and that counts as a vote. 10 seconds! "We use SketchUp because it is nimble and easy to use and it allows us to develop our designs quickly. We start in SketchUp and stay there throughout the design process." AMHERST — For years, Michael Davidson has been teaching landscape architecture at the University of Massachusetts in a building that was a former dorm. He can't wait for the new $52 million Design Building to be finished. He can keep track of the building's progress from the former Hills dorm overlooking the site. "It's very exciting," he said. "This is designed by designers for designers ... to teach design," and will serve as a teaching tool in its own right. We ask: If the 19th century modern building technology was associated with steel and the 20thcentury with concrete, could the 21st be the century of “MCT,” mass construction timber? Wood, one of the world’s oldest (and greenest) building materials, was the de facto construction material in American cities for over two centuries, falling out of favor when non-combustible materials capable of building high and wide emerged.